I consider buying the Bach Cello Suites by Fournier. How does it compare to other hailed performances like Casals, Starker (the one I have already) or Rostropovich? I can't be of very much help, since I don't know Fournier or Starker. But I do know Casals - absolutely marvelous - but I think he is not easily compared with anyone else - a case of "hors concours" so to speak. The historical nature of the recording just enhances that status. Both Starker and Fournier fall into the more romantic tradition of cello performance. The Fournier recording is characterized by warm, silken and mellow cello tone, and a more romantic style interpretation. I don't think Fournier could do anything that wasn't completely elegant. There is a quality of "rightness" about his work, the suites are as natural as breathing. The sound quality is not bad either, but there is some inevitable tape hiss. In comparison, Starker is more austere -- less emotional in tone. Starker recorded the suites numerous times, I know of three recordings: first for Mercury, then for a small Canadian label (Sefel) and finally for RCA. The best set is on Sefel, he was still strong and the sound quality is tops (I believe DG actually did the recording and engineering for Sefel). I'm not sure what is going on with the Mercury recordings, but there is something about the sound signature that I find very annoying. Despite loving Starker's work, I have a difficulty listening to those recordings. You won't find the 2 Sefel cds of the suites anywhere so don't bother looking. It was a very limited production and the master tapes fell into the hands of someone who won't license them out at all. By the time Starker recorded the suites for RCA, he wasn't as physically able as in the earlier recordings. While the first 3 suites are alright, the last 3 aren't done with the same technical mastery. However, Starker's work is extremely mature and moving. Fournier was still playing at a very high technical level when he recorded these suites, so in that sense they compare very favorably with the RCA Starker. Both artists created unique and beautiful recordings of the suites and if you enjoy a more romantic style of cello playing, you won't go wrong picking up the Fournier. I'm not as familiar with Casal's work on the suites; I only have the one Pearl recording and I haven't listened to it in quite a while. However, as I recall, his style was also in the romantic performance tradition, so the Fournier should compliment that set very well. I don't have the Rostropovich, so I can't comment on that at all. Thank you for this long response Bunny. It was helpful, and for sure I will buy the Fournier set. It is the Mercury Starker set I have. Starker recorded the suites numerous times, I know of three recordings: first for Mercury, then for a small Canadian label (Sefel) and finally for RCA. The best set is on Sefel, he was still strong and the sound quality is tops (I believe DG actually did the recording and engineering for Sefel). He seems to have recorded these suites very many times. If I recall correctly, he recorded a few of the suites for Saga ca. 1957. And later for EMI in the later 1950es (mono). The Mercury recording was made !963-65. Next the unavailable Sefel recording (date?). And last the RCA recording (date?). I own the EMI and the Mercury releases. Generally I find his austere, introvert style most rewarding. The Saga and the Sefel releases are in reality unavailabe. My question is : Is the RCA release mandatory. When I first heard his set, I was turned off by it, but it's since grown on me. No question: it's big-boned, muscular Bach played in a reverberant acoustic. It's Romantic and indulgent--yet it's personal, distinctive, and often beautiful in its way. Bach can survive--indeed, he can benefit from--many interpretative approaches, transcriptions, etc., including one that underplays the sprightly dance-like feel so important to what many consider "proper" Baroque interpretation. I have the second cd of the Sefel recording, so for me the RCA became a must buy because the first 3 suites from that recording most closely compliment the lost Sefel first 3 suites cd. (Yes I had it and it was stolen from my house by someone -- I'll never figure out who took it. I am grateful that I still have the second cd.) Starker's work on the RCA last suites is not as strong techically as in his earlier recordings, but the first 3 suites are tremendous. Moreover, despite his decline in technique (he no longer performs the suites), he more than made up for it with his insight into the music. He was never one for frills, and as he aged his work became even more ascetic and more powerful. The last recording on RCA is Bach pared down to the essence. I'm sorry I don't have all of his recordings, the ones I have never fail to move me. The flute sonatas and partita performed by Frans Brüggen (Sony Seon). Probably not many people remember him as a recorder/traverso player since he has become a great conductor. But this is THE classic when it comes to HIP versions of this music - not to be missed if you happen to see it in a record shop! 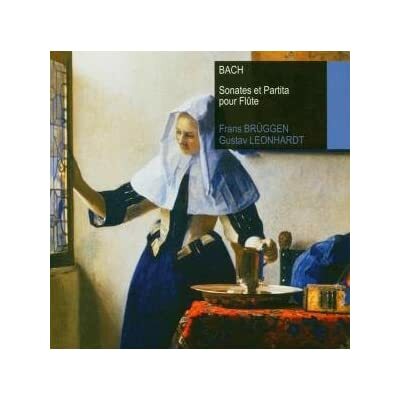 I found this available at Towerrecords for $5.52 -- Bach J.S: Sonatas & Partitas For Flute / Bruggen/Leonhardt. At that price it's an automatic buy item for me. Beware that you may not be getting the whole thing (but the most important part anyway). The original Seon version is on two rather loosely filled discs. There are 18 tracks on the cd and total time is 73:23. I'd love to know which works may have been cut. Two arrangements, from BWV 1013 and BWV 1030 respectively, for chamber ensembles appear to be cut. Five tracks in total. The BWV 1013 arrangement offers "alternative instrumentation," i.e. assigning each movement to a different instrument - viola, harpsichord, baroque cello, recorder, violin. The BWV 1030 arragement has the first movement transposed to d minor, and plays it like a concerto. Well, I knew something was missing because I found a description of the original set online and it listed many more musicians. Well these are really kind of neat to have but hardly manditory. I think it is cool to have all authentic Bach sonatas and suite performed by Bruggen on a single, cheap disc. Well these are really kind of neat to have not hardly manditory. I think it is cool to have all authentic Bach sonatas and suite performed by Bruggen on a single, cheap disc. Yes, and with a picture of Vermeer's lovely lady with a water pitcher. I'm familiar with both the review and the reviewer. As it happens, that reviewer is a very strong HIP advocate who reacts negatively to any facet of a Bach performance not in his comfort zone. On the other hand, this reviewer knows his Bach very well. Regardless, I'm sure I'll be acquiring the Mullova/Dantone set; these two performers rank quite high with me. That's a very good recording of the Art of Fugue... some of the movements are played by a string quartet and some others by two harpsichordists (Staier-Hill). Is this back in print? It is an excellent recording - my favorite in fact. Just wanted to relate that since the time of the MusicWeb review, I've read two that raved about the set. I've just read a fairly positive review by Lindsay Kemp in the september issue of the Gramophone. Though I'm not a real fan of her (she has a bit the taste of an English old lady - maybe she is just that.. ) and her favourite is Podger/Pinnock, a preference I do not share.